This following is an update on progress for the Adoption Program and the Contraception Program as described in the Memorandum of Understanding (MOU) between WHOAS and the former Alberta Environment and Sustainable Resource Development (ESRD) signed on November 4th, 2014. The first annual report was submitted and approved in August 2016 so this report covers the remainder of the year from July 2016 to December 2016. This report is intended as the annual project report specified in the MOU. The next report will be submitted in December 2017. The adoption program is described in detail in the MOU of November, 2014 and in the previous report to AEP dated July, 2016. A supply of hay was purchased for the winter months, if needed. 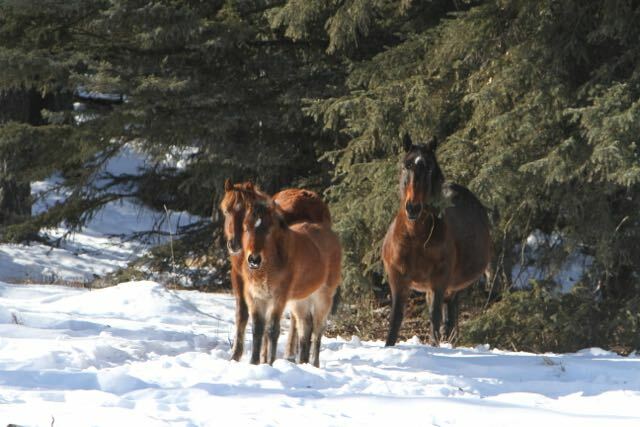 WHOAS continues to take in under permit horses that have become a problem to landowners or that have become trapped and abandoned or injured. Problem horses are generally young studs that have repeatedly broken down fences to get to domestic livestock. Injured horses include foals that become entangled in fences and abandoned by the herd. Occasionally WHOAS responds to calls to rescue stray domestic horses on Crown land. These domestic horses are rescued and cared for by WHOAS, but come under the auspices of the LIS. Complaints about problem horses are generally reported by individuals. We have been working with parties near Nordegg to find a resolution for four wild horses that have been causing problems near a youth camp. WHOAS has also assisted with advice to the ASPCA and local authorities about problem horses near Fort Vermillion. Unlike the Government cull program, which was not implemented in 2016, the general public continues to be very supportive of the WHOAS adoption program. There is significant support for removing problem and injured Wildies, even from the most vocal opponents to any form of population management for the horses. The WHOAS adoption program for problem and injured Wildies is also well supported by ranchers and landowners in the area. In the past, horses that come into conflict with property, livestock or humans would have been sold at auction and almost certainly destined for slaughter. Success with the gentling and rehoming of these horses continues to be highly successful. However, older stallions require longer periods of gentling and training and more experienced adoptive homes. WHOAS continues to vet potential adopters carefully and tries to make the best decisions possible when matching a horse to a potential adopter. Horse training clinics for potential adopters and the general public are in the early planning stages for 2017. The cost of transporting, feeding, gentling, and providing veterinary care and gelding for the horses during the period July to December 2016 was approximately $7,000. This does not include the many hundreds of volunteer hours involved in caring for and gentling the horses and maintaining the rescue facility. The following is a summary of horses handled at the WHOAS facility between July 2016 and December 2016. July 2016 – December 2016 2 older male thoroughbred horses were reported to WHOAS and rescued These horses were reported to the LIS and taken in by Bear Valley Rescue under permit. They will live out their days there unless suitable adoptive homes are found. WHOAS has applied for and received approval for a freeze band W over H on the right hip. In the future all wild horses that pass through the WHOAS facility will be freeze branded. Freeze branding is one of the best methods of identifying horses. It is the process of using a super cold iron rather than the traditional hot iron method. When done properly, by a veterinarian, the cold iron destroys the pigment-producing hair colour follicles. White hair will outline the brand site once hair growth returns within a month. 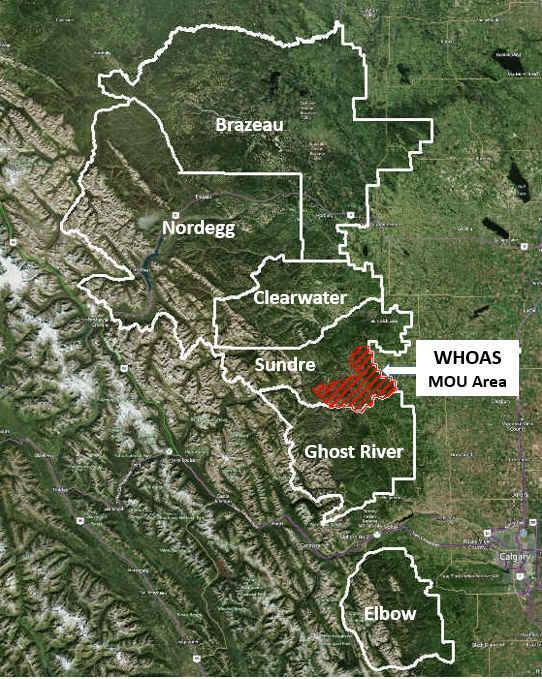 The Memorandum of Understanding (MOU) established between the Wild Horses of Alberta Society (WHOAS) and the Government of Alberta (GoA) in November 2014 provides for a pilot immuno-contraception project in a portion of the Sundre EMZ. The purpose of this pilot program is described in the MOU and in the previous report submitted in July 2016. The previous report also provides detailed information on the ZonaStat-H vaccine and its effectiveness and documents the WHOAS team’s ability to carry out the project in a vast and remote area. Table 2 summarizes the Contraception Program to date. So far, WHOAS has spent just under $17,000 on the program. The actual cost per vaccinated horse over the 5 years of the program is approximately $80. During the period since the previous report (July, 2016 – December, 2016), 22 mares have been vaccinated with the ZonaStat-H vaccine. It is still too early to provide detailed results from the program, but a more in-depth analysis of the results will commence at the beginning of the next foaling season in Spring 2017. 9 mares were vaccinated before the March, 2015 cut-off date, which means that they should not have foaled in 2016 (85% confidence). From our observations of mares darted prior to March, 2015 this appears to be the case and the vaccine is proving to be well within the expected range of effectiveness in preventing conception. An additional 51 mares were vaccinated before the March, 2016 cut-off date for breeding (i.e. start of estrus), which means that during the 2017 foaling season we will have 60 vaccinated mares for data collection and analysis. To date there have been no observed harmful effects of the vaccine on the vaccinated mares or foals, nor have there been any observed adverse affects on the herd dynamics. In October 2016 the CBC National News aired a 10 minute documentary on the WHOAS contraception program and praised it as an innovative and humane approach to population management being undertaken by a charity staffed entirely by volunteers. The overwhelming popularity of this piece prompted the CBC National News to air an extended 30 minute version of the documentary several times over the holiday period including Christmas day, Boxing Day, New Year’s Eve and New Year’s Day. The WHOAS field volunteers continue to undertake the monitoring and identification of herds within the WHOAS Study Area. 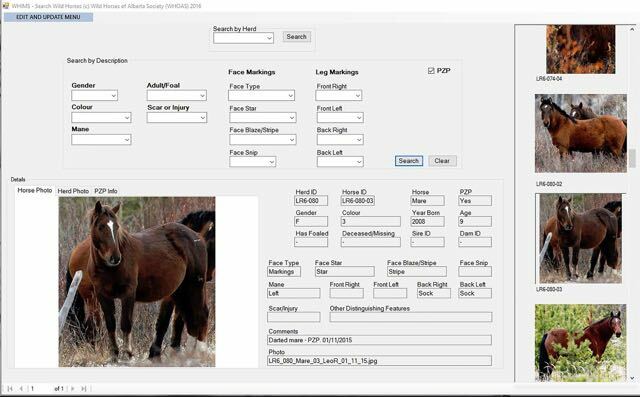 Three Windows tablets have been purchased for the program and the WHOAS field volunteers take these into the field to more easily identify and track horses using an updated version of the Wild Horse Identification and Monitoring System (WHIMS). Data entry has also been facilitated by the development of a new edit and update module for WHIMS. In addition to the ongoing field data collection and monitoring, WHOAS has collected a significant amount of information and data on historical horse counts from various sources. These numbers indicate that there is a discrepancy between earlier (pre-2010) ESRD aerial count data and the numbers from these other sources. WHOAS would welcome the opportunity to sit down with AEP to provide input that may be useful for the horse population management plan that is currently being prepared by AEP staff. WHOAS would also be pleased to provide input into the Horse Capture Regulation that is due for renewal in 2017.  The adoption program and the running of the rescue facility continue to be successful.  The removal and rehoming of problem or injured and abandoned Wildies continues to be supported by the general public and landowners.  A detailed analysis of the PZP program success will commence in the Spring. WHOAS contraceptive program has received national recognition and praise from the CBC National News and will be the subject of a 30 minute documentary to be aired over the Christmas holiday period.  WHOAS would welcome the opportunity to provide input into the AEP horse population management strategy currently being developed by AEP staff.  WHOAS would also welcome the opportunity to provide input into the Horse Capture Regulation that is due for renewal in 2017.